On the computer running the Fernhill SCADA Server, open the Control Panel. Check the Status is Started. Note: If Status is not showing Started, open the service Properties and try to start the service. 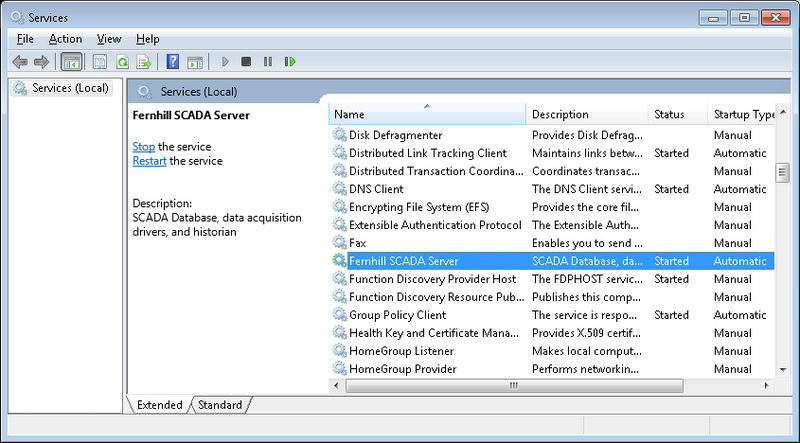 See Managing the SCADA Service on Windows for more information about managing the Fernhill SCADA Server Windows Service. Check the Active: line shows active (running). Note: If the Active: does not show running, try and start the service. See Managing the SCADA Service on Linux for more information about managing the Fernhill SCADA Server Windows Service. The Fernhill SCADA Server accepts connections from client applications on TCP/IP ports 20295 and 20296. On the computer running the Fernhill SCADA Server, open a Command Prompt with administrator privileges. Note: If another program is listening on either of the ports there is a port conflict. Try to change the configuration the other program to remove the port conflict. On the computer running the Fernhill SCADA Server, open a Command Prompt. 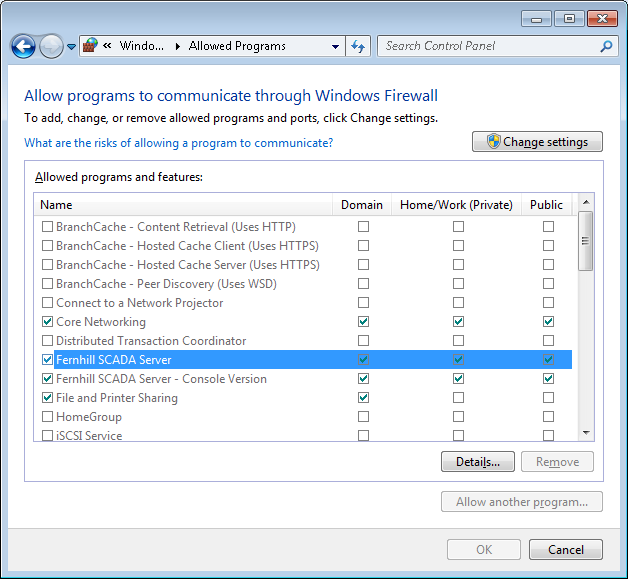 The Fernhill SCADA setup program automatically adds rules to the Windows Firewall to grant network access to the Fernhill SCADA Server. It is possible another user or program has modified, or removed, these rules which is preventing programs connecting to the Fernhill SCADA Server. Note: If firewall rules are missing try to rerun the setup program in repair mode to reinstate the firewall rules. An additional software firewall installed on the PC running the Fernhill SCADA Server. A network device performing the function of a firewall. Configure any additional firewalls to accept connections on ports 20295 and 20296. On the computer running the Fernhill SCADA Server, start the operator interface. Use the method described in Start the Operator Interface From the Windows Start Menu. Click on Connect to a Fernhill SCADA Server. Enter localhost in the Computer Name field. Click OK. Confirm the default graphic page opens. The Fernhill SCADA Service is running. The Fernhill SCADA Server is listening on ports 20295/20296. The Windows Firewall allows connections on ports 20295/20296. No other firewall product is blocking ports 20295/20296. Submit a bug report to support@fernhillsoftware.com. Try and include the server log file for the connection attempt. You can run a ping test to check the network connection between two computers. A successful ping test will show you have a working network connection between two computers. A failed ping tests does not mean the network connection is not working. A ping test can fail because firewall rules are blocking ICMP Echo requests. On the remote computer open a Command Prompt. Where Address is the IP address of the computer running the Fernhill SCADA Server. 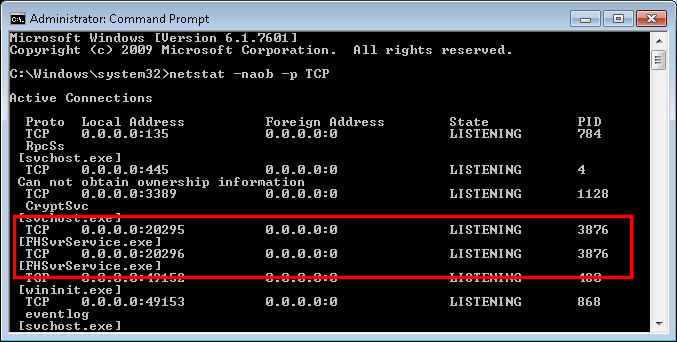 If the ping test fails check the Windows Firewall on the computer running the Fernhill SCADA Server allows ICMP Echo Requests. The Microsoft Technet article Nobody Can Ping My Computer provides details how to do this. To more information about the Operator Interface. To learn about the Fernhill SCADA Server.